Leighlinbridge (Irish: Leithghlinn an Droichid, meaning "Bridge of the Half-Glen") is a village on the River Barrow in County Carlow, Ireland. Much of the town of Leighlinbridge has the air of an earlier century. It features narrow winding streets, grey limestone malthouses and castle ruins overlooking a 14th century bridge across the River Barrow, reputedly one of the oldest functioning bridges in Europe. The town's original Black Castle, built in 1181, was one of the earliest Norman fortresses in Ireland. It was granted to John de Claville by Hugh de Lacy, the powerful Norman baron who governed Ireland for Henry II. The present castle was built by Sir Edward Bellingham in 1547 and fell to Cromwell's forces in 1650. The nine-arched bridge which spans the Barrow is the oldest on the river. It was built in 1320 by Maurice Jakis, a canon of Kildare Cathedral, to facilitate movement within his diocese. The bridge was widened in 1789 and the careful observer can see signs of this work. 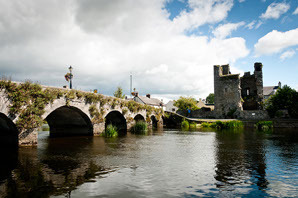 Leighlinbridge has won many environmental awards, including county winner in the National Tidy Towns Competition, first in the Barrow Awards, overall national winner in Ireland's Green Town 2000 and represented Ireland in the European "Entente Florale" competition in 2001. The nine-arched 14th century bridge in Leighlinbridge.